I am having a currency field similar to the below one. 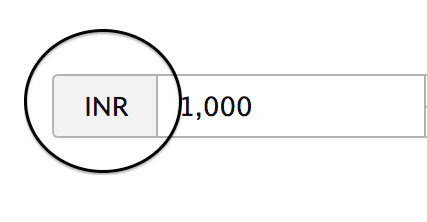 What is the UX terminology for the portion which holds the text "INR" and non-interactive. I have to decide the SCSS variable name (should be semantic) for that portion. If we name them as label, there exists a chance for misconception with the form label element. Kindly assist me. Not the answer you're looking for? Browse other questions tagged website-design terminology input-fields labels or ask your own question. Best design practices for multi-brand website header? Does anyone know of any examples of the use of character counter on an input field? Forms: Use visible input hint next to field or hidden hint behind info icon?